The next step in the process is to tape the edges of the jacket and reinforce the vents. It’s all about handsewing, which I happen to enjoy, probably more than I’m supposed to. I find it very enjoyable. Not only is it satisfying, I also love the fact that I’m participating in an activity, a tradition, with a long history. While I stitch away I fantasize about working in a great atelier, perhaps making a coat for royalty! Fantasy aside, I like to sit by a window, watch the snow fall and listen to some music. My current soundtrack is The Weepies. Love them! 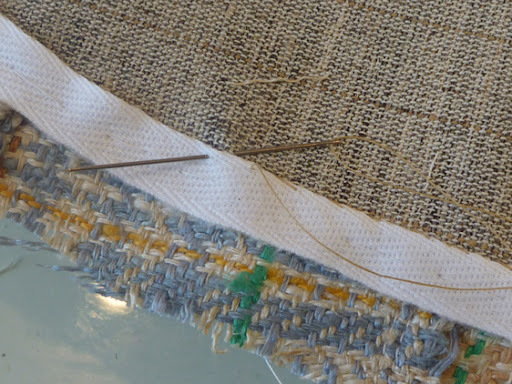 The canvas is oversized so any excess canvas is trimmed away after the fronts have been basted. 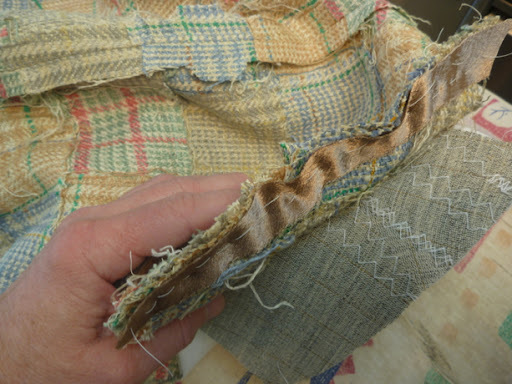 The seam allowance is then marked on the canvas and very carefully trimmed away. This step always makes me nervous because one risks inadvertantly clipping the jacket fabric. As Cabrera says frequently in his book, “give this step your full attention”. The alternative is complete ruin. 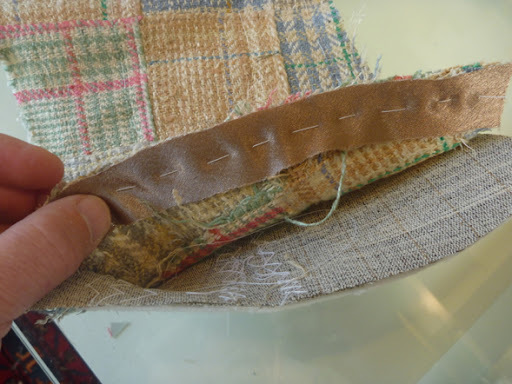 The twill tape should be soaked in cool water, dried and pressed before using. Starting at the neck, the tape is basted along the seamline through all layers. At the break, the tape is cut almost to the edge and a small wedge is clipped out. This insures that the tape will lay flat when the “corner” is turned. 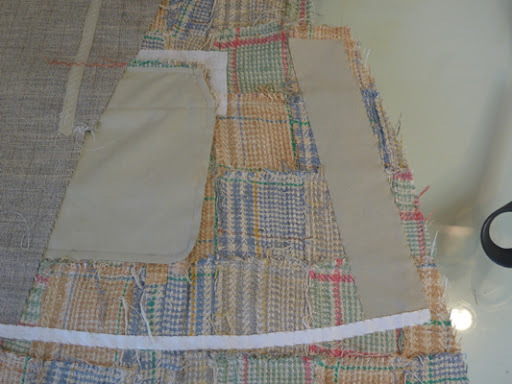 The tape runs down the jacket front and then along the hemline. 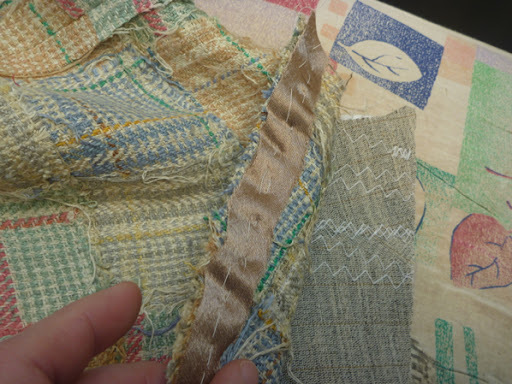 Now that it’s all basted into position, the edges of the tape are slipstitched to the canvas on one side, and into the fashion fabric on the other. None of these stitches should be visible from the right side of the jacket. Put on some music that you love and enjoy the process! So here is the tape all sewn into position. 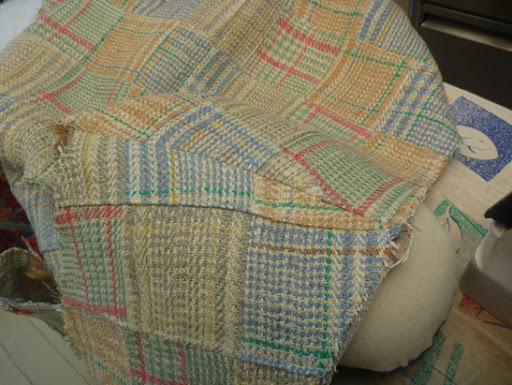 Lastly, a crossgrain strip of pocketing is slipstitched at the edge of the vent. Again, these stitches should not be visible from the right side of the jacket. This completes the work on the jacket fronts, and they are ready for the front facing. At this point the body of the jacket can be assembled, and there’s a sudden feeling of huge amounts of progress being made. Go to your stash (I know you have one!) 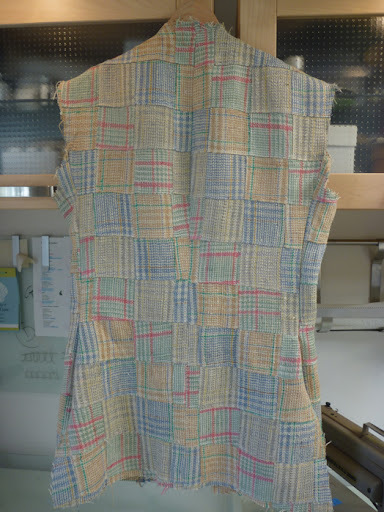 and cut a strip of “semi-bias” lining. This strip is basted to the front shoulder as a reinforcement. Note how the canvas has been peeled back. 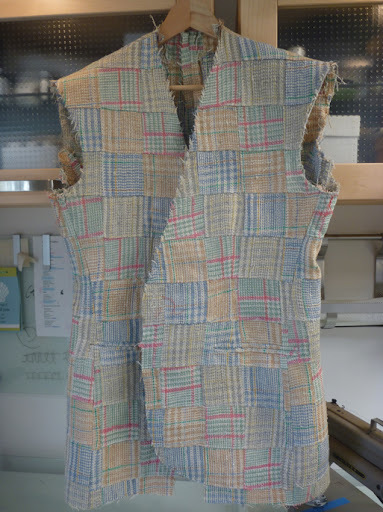 The back shoulder seam is wider and will need to be eased. In this picture you can see how it ripples. Steam press the wrinkles out, extending the tip of the iron only an inch beyond the seam line. Now stitch the shoulder seams. Pressing out the wrinkles makes this seam so much easier to sew. 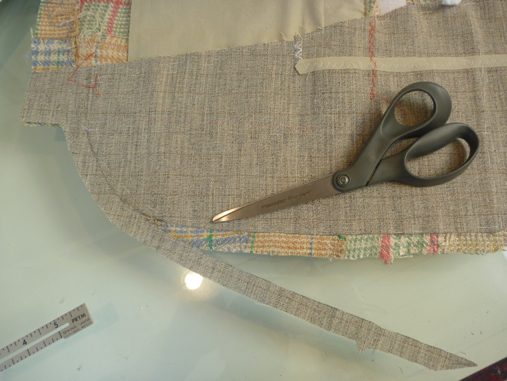 Press the shoulder seam over a tailor’s ham which will help preserve the shape. Now simply attach the back to the fronts. I like to stitch down to the waistline, remove the piece, and then stitch up from the hem to meet my stitching at the waistline. Thank you Edna Bishop for this tip, which helps prevent distortion of the garment. So here’s where I am so far. The jacket body from the front. Now it’s on to the sleeves and even more tailoring geekery! As always, I hope you are finding this informative. Very informative. More geekery, please! beautiful work! i love seeing all the details. Agreed, beautiful work. Hand stitches so lovely, it's too bad they won't show! 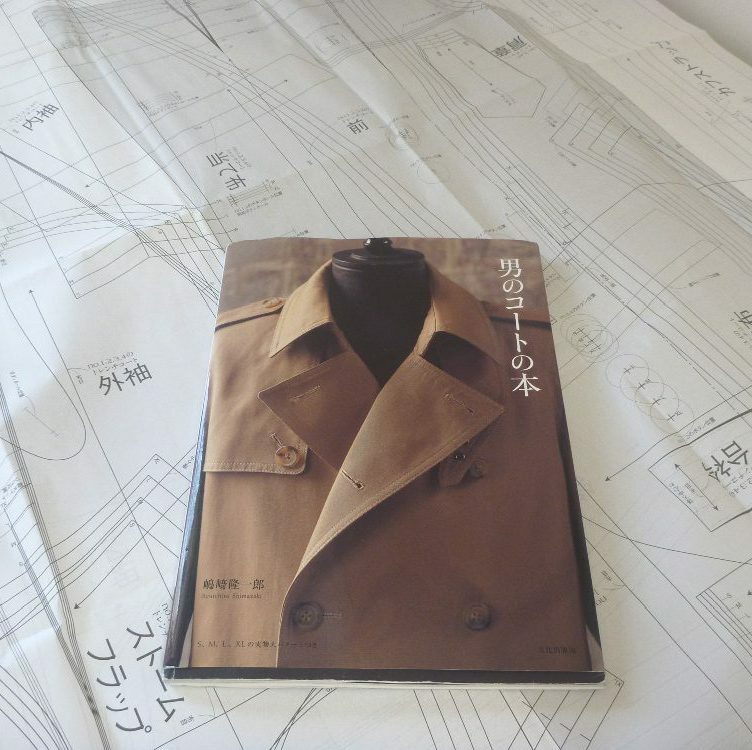 The jacket is coming along nicely, and I'm enjoying reading about the process. It's fascinating. 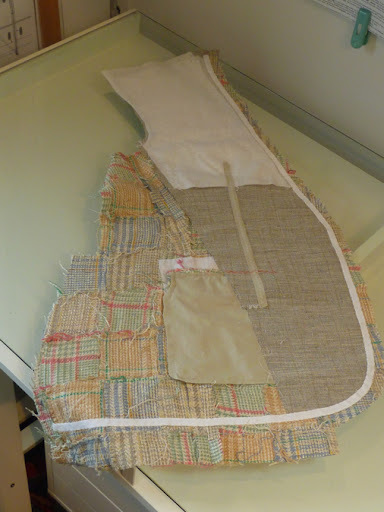 I love all the fol de rol that goes into tailoring too. 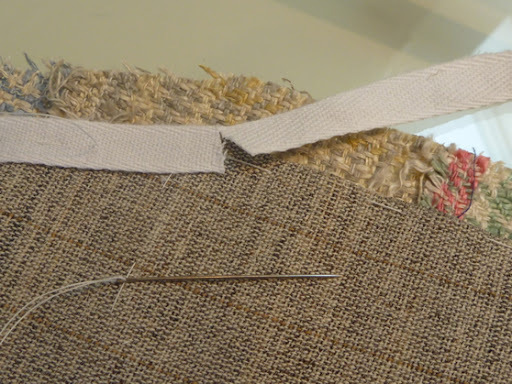 Hand stitching really is relaxing isn't it!